Or 'Sweet and Savoury Open-Faced Sandwiches' to give it it's very unsexy English name. If we're being really pedantic here, it's actually 'Different Stuff on Toast'. But it sounds so much nicer en Français. Today's recipe choice comes from Rachel Khoo's Little Paris Kitchen which I accidentally bought earlier this week when the Book People were peddling their wares at work. I picked it because for once I actually managed to get home in time to collect Miss A from nursery. A very rare event these days. And it was only because I had an unavoidable medical appointment just before the end of the nursery day. I'm still trying to get my head around being the breadwinner of the family and reconciling that with being a mum too. In my pre-baby head, the two things never went hand-in-hand. I'd either have a career or a family. Not both. But life is rarely as planned. I'm getting used to it as my skin has finally started to thicken against the barrage of outright criticism and snide comments from people who have no right to comment on my life and the thoughtless mouth-engaged-before-brain comments from some of my nearest and dearest. Yes, that's butter, not cheese under the radishes! The most cutting comments often come from the mouths of babes. And Miss A has put me firmly in my place this week. When she's angry with me she tells me 'I don't like Mummy any more' and that 'Mummy should go back to work in Bristol'. When she's talking about her favourite people, she tells me that Emma is her 'Daytime Mummy' or her 'Other Mummy'. As lovely as Emma is, she's only Miss A's nursery teacher from when she was in the baby room. Miss A only spends two days a week at nursery - the rest of the time she's with the husband. I'm now known as 'Real Mummy'. It's nice she makes the distinction but it still makes me a tad jealous. So of course, when I do spend time with her, I have this massive need to make up to her for the fact that I'm out trying to keep a roof over her head and keep her in stickers. Normally, her after school snack is malt loaf or a gingerbread butterfly (all home made just in case Mrs Sconegate is still lurking - yes, I still can't let that go!) but today, I wanted to make something we could share together. The tartines seemed ideal. Basically, Khoo gives you a set of ideas of things to pop on toast. Ordinarily we'd have jam or peanut butter and chocolate Philly but I love all of these different ideas. Toast is probably my favourite food ever. I've mentioned previously that if I was stranded on a desert island, my luxury item would be a toaster (I forgot to say solar-powered last time). So I was really excited to try some of the recipes out. And the remains of Dan Lepard's Zopako from the weekend made the perfect base. Miss A had chocolate Philly and sliced strawberries on hers (not in the book). 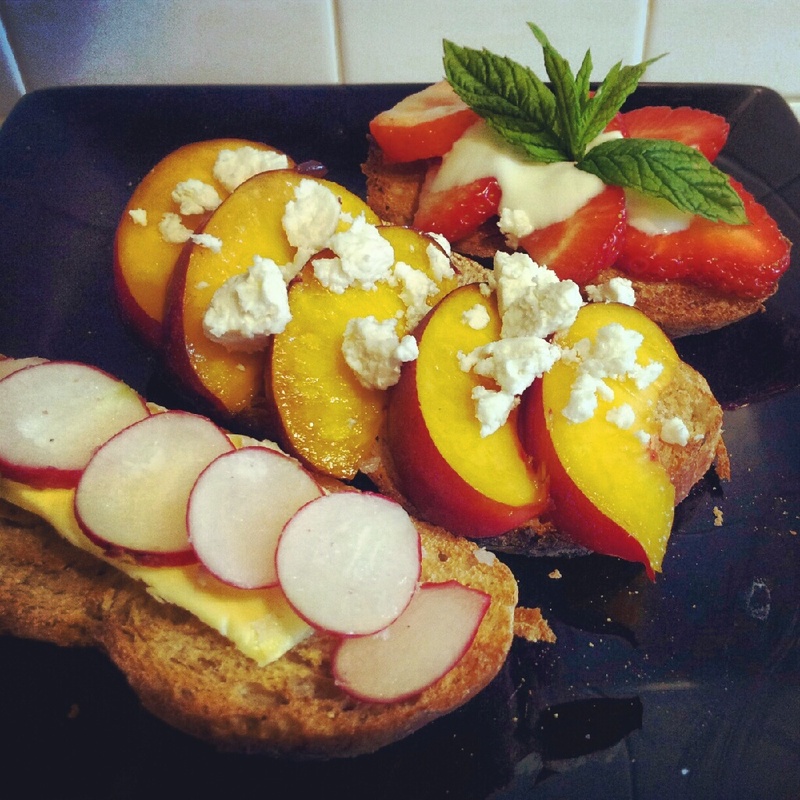 I plumped for Radish and Salted Butter; Feta and Nectarine (inspired by Khoo's Peaches and Brie of which I had neither in the fridge) and Strawberry and Creme Fraiche. I knew the fruity ones would go down well but I was intrigued by the radish one as I've only recently started to eat radishes. Except someone had other ideas and swiped it. I was amused because I am still battling with Miss A over whether or not she'll eat veggies and had assumed if she picked anything, she'd go for the strawberry one. Never mind. She prodded her fingers into the thick layer of butter, spread some chocolate onto one end, ate a mouthful with a radish, added a strawberry, offered me a bite and then immediately snatched it away. So I can only imagine how it tasted, but if she enjoyed it then I'm sure I would. I'll definitely try out some of the other ideas - especially looking forward to Avocado and Grapefruit; and Chocolate and Olive Oil. I guess it's all about getting out of a creativity rut and not just defaulting to jam or cheese when it's toast time. I can see my diet going out of the window some time very soon with this book.